Good evening Tunapuna and Good evening Trinidad and Tobago. It’s hard to say that when the murder toll is 100 and a 71-year-old man can be gunned down in front a mall filled with families in broad daylight on a Sunday afternoon. Nevertheless, I am pleased to be back in Tunapuna tonight. On Saturday, we opened our brand-new East-West Corridor People Centre right here in Tunapuna. This new East-West Corridor People Centre will serve as a hub of community development. But the best part is that this East-West Corridor People Centre is just the first of many Centres we intend to open right across the East-West Corridor and all over the country! This new centre is part of the UNC’s “One Corridor” movement, which is designed to bring people together. We are listening to you, what your needs are, and we will work together to develop solutions.Now is the time for you to let your voice be heard. I have called on young people to get involved and tonight I repeat that call – “Step Up, Claim Your Space”, let’s get T&T working again! The PNM is always trying to claim that the UNC neglected the East-West Corridor. That’s another of their lies and attempts to deceive – we worked here along the corridor and we worked all across Trinidad and Tobago! So, don’t let them try to push that divisive talk that they like to do and say the UNC only developed south of the Caroni. You see that is the way they operate – they have nothing to show for their almost four years in office, so they lie and try to paint us in a bad light. But we will not be deterred. We have always focused on people-centred development, and we have worked to build communities across Trinidad and Tobago. And in our next term in office, we will continue the work we started for the benefit of citizens! Last week in piloting the Companies Amendment Bill in the Parliament the Attorney General Faris al Rawi said and I quote: “I love companies’ law. Quite frankly I enjoy corporate law”. I will tell you tonight why the Attorney General loves company law so much. This is the same man who was telling the country that it is companies that are used by people to hide their wealth. I’ll show you how they do it tonight! There is a company registered in the Company’s Registry under the name “Zaman Enterprises Limited”. This company only has two shareholders who hold one share each valued $2.00. So, the entire share capital of this company is $2.00. I will tell you who the shareholders are in a little while. You will find out tonight. In 2006 this company bought a property known as No. 3 Alexander Street St. Clair. I have the deed here in my hand. The price this company paid for the property was $2.5 million dollars. I have a document here in my hand which is captioned “Cabinet Minute No. 290”. Any Minister of Cabinet is free to come forward and challenge its veracity. I also have a copy of an accompanying document captioned NOTE FOR CABINET dealing with the same property. According to these documents the Cabinet led by the Prime Minister agreed to lease this property known as No. 3 Alexander Street St. Clair for the price of $644,000 per month for three years (that is $575,000.00 plus VAT =$644,000). The rental of this property, that was bought for 2.5 million dollars will put TWENTY-THREE MILLION ONE HUNDRED AND EIGHTY-FOUR THOUSAND DOLLARS in the pocket of some people. $23,184.000. FOR THREE YEARS!!! Do you want to know who these people are? I have the last annual return for this company filed on the 27th April 2018. On the last annual return, the shareholders of ZAMAN ENTERPRISES LIMITED are FARIS AL RAWI and MONA NAHOUS. This is the same FARIS AL RAWI who last week was telling the country that it is private companies that are used to hide wealth and we should know who are the real beneficial owners. According to the documents I have here, the note that was taken to Cabinet for the lease of this building was dated the 12th February 2019. It was considered and agreed to by Cabinet on the 14th February 2019, only two days later. When this note was taken to Cabinet only the first page of the annual return was annexed to the note so that the Cabinet would have seen who were the directors but not who were the shareholders. Who were the directors of the company at that time… MONA NAHOUS AND ABRAHAM AL RAWI, THE WIFE AND SON OF THE ATTORNEY GENERAL. But who were the shareholders at this time when Cabinet was being asked to lease this property? THE ATTORNEY GENERAL AND HIS WIFE. But interestingly Cabinet was never shown who were the shareholders. The Attorney General must tell the country why was the Cabinet who were making a decision to rent a building for more than $23M was not told that the building belonged to him and his wife. My research shows that this transaction was being considered by the Ministry of Public Administration before August last year that is whilst the AG was a director and shareholder of the company along with his wife and son. By letter dated 15th October 2018 Nazem Nahous, the father in law of the Attorney General was writing the Permanent Secretary of the Ministry of Public Administration and let me read to you what Faris’ Father in Law was telling the Ministry. “We are pleased to accept the State’s offer to lease the captioned A Class commercial building at the rate of $600,00.00 per month VAT exclusive”. So, the State was offering to lease the property owned by the Attorney General and his wife and, his father in law was writing to tell the government that he was pleased. At this time the legal advisor to the government is none other than the joint owner of the company that is leasing the property to the government. All this time the Attorney General is a director and shareholder of this company. All this time the Attorney General owned HALF of the Company. But it gets better while the negotiations are going on and before the matter goes to the Cabinet the Attorney General removes himself as a director of ZAMAN on the 8th November 2018 and leaves his son Abraham Al Rawi and his wife as Directors. Why he removed himself as a director of this company? Why was this done immediately days before his father in law accepted a state offer to rent the property for millions of taxpayers’ dollars? Was the AG involved or aware of these discussions that the company he and wife owned was having with a government of which he as Attorney General was the absolute legal adviser? Did he advise and participate? What does he have to hide? Why was Cabinet not told he was a shareholder of this company that was to benefit from this 23-million-dollar contract? And this is not a one percent or five percent. According to the on-line search conducted this morning, the documents show that the Attorney General was and IS 50 percent shareholder of the Company. His wife owns the other 50 percent. What was the role of the office of the Attorney General in providing advice to the Ministry of Public Administration in this matter? Did he make full and frank disclosure of the totality of his interest in this transaction to the Cabinet? I am reminded of FARISGATE – do you remember the bacchanal involving children posing with high powered guns? Do you remember the report which was done and then proven to be a lie and a failed attempt to cover up the complicity of a SENIOR GOVERNMENT MINISTER? So, like you, I don’t trust this government, and Faris? NOT AT ALL. Tonight, I CALL ON all Cabinet Ministers present at the Cabinet when this matter was discussed to state whether they were aware of this potential conflict when they approved this transaction. Are you innocent or guilty? I call upon the Commissioner of Police to launch an immediate investigation into this matter for breaches of the Prevention of Corruption Act and misbehavior in public office. I shall be bringing this matter to the attention of the Integrity Commission. The Prime Minister refused to act on Faris gate effectively protecting the Attorney General for years in a matter for which many believed he should have been fired. My friends, this Rowley-led Government is taking our country down a dangerous path, and they seem intent on giving away our national patrimony. We have learned that moves are being made to sell Paria Fuel Trading as well as the Refinery. Espinet says its for sale, Franklyn Khan today says its not for sale. Who is telling the truth? I put to you tonight that it seems that the government does not have any idea what they are doing with Petrotrin. Paria Trading – the newly-minted company responsible for importing fuel into the country – just a few months after it was created, they want to sell it. Why? This is the same Rowley Government who manufactured a crisis with the sea bridge-nearly crippling the economy of our sister isle Tobago and then decided that they needed to buy more boats. I want to ask now – is the same thing being done with Paria Trading? Is another manufactured crisis about to take place where Rowley say unless Paria Trading is sold T&T will no longer be able to import fuel? The refinery is such a loss-making enterprise that it needed to be shut down-but now miraculously 50 companies want to buy it. You hear chain up? My friends this is a government of secrets and lies! These assets belong to the people of Trinidad and Tobago yet they are acting like it’s theirs to give to their friends and financiers. Espinet must now tell this nation to whom are our revenue streams being sold off to? What procurement method is being used to sell off the assets of our citizens? What measures are being put in place to guarantee our nation’s fuel security and price stability? These are questions that must be answered. patrimony. Don’t sell at basement bargain prices.Let the people of Trinidad and Tobago decide in the 2020 elections if they want to keep these assets! My friends, here in Tunapuna and indeed across Trinidad, people are worried about the high crime levels, no jobs, and poor amenities. No sustainable jobs have been created by the PNM in the past three and a half years? No sectors have seen job growth?No industries have engaged our young graduates? This Rowley-led Government has presided over tens of thousands of job losses. By his own admission over 20,000 jobs were lost in the first two years of his Government, but we know now that that figure is much, much higher about 50000. Under the UNC, we worked to create jobs. To maximize the full potential of our people and nation we must embrace the economic challenges of the 21st century. The UNC believes what we need is ECONOMIC TRANSFORMATION. When the UNC returns to Government, we will immediately implement our National Economic Transformation Plan. Diversification is at the heart of our economic plan. We will encourage strategic investments in niche non-energy sectors where we have strong competitive advantage, market opportunity and growth potential. We have developed 12 key strategic Prosperity Engines spread across both Trinidad and Tobago. These prosperity engines will mobilize and engage the private sector, both local and international, and will have large positive multiplier effects in kickstarting economic recovery, fostering growth and supporting diversification. These prosperity engines will spur a dynamic, sustainable, technological, resourceful economy which allows our people to prosper and fulfil their potential. We consider the East West corridor to be instrumental in becoming a conduit for national economic transformation. We will invite private investors to establish a biotechnology manufacturing zone along the East-West Corridor. This manufacturing corridor will attract entrepreneurs and firms (both local and international) to create a cluster of industrial applications in agro, health and wellness, and industrial and environmental biotechnology. Such areas could include therapeutic and nutraceutical plants, exotic livestock development, integrated aquaculture systems, biopesticides, crop genetic improvement, ageing medicine, generics and biosimilars, bioinformatics and environmental conservation. We will invite private investors to build and manage an aircraft maintenance, repair and operations (MRO) hub in the Aero-Park at Piarco International Airport. One of the major challenges faced by air transport in Trinidad and Tobago and the Caribbean is the lack of a major aircraft maintenance facility, so airlines have to conduct aircraft repairs overseas. Trinidad and Tobago could serve as an aviation centre for the wider Caribbean with significant experience in airport administration, air traffic management, aircraft inspection and air navigation services. Exemption of property taxes for these businesses. By the way I would like to know what is the status of property taxes. Are they hiding it only to bring it back out after the elections? Increased customs duties on imported products that we propose to manufacture. We have to protect our manufacturers. The rest of the world is doing it for their people. A UNC government will protect our manufacturers. Tax write-off on capital expenditure and investments in plant, machinery, building for over the first 15 years of operation. Tax breaks for training and retraining of employees. Increase in testing by Bureau of Standards of imported products that compete with our local products to prevent dumping of inferior products in Trinidad. A UNC Government will back financing for local companies wishing to establish manufacturing industries on the east – west corridor. I plan to incentivize companies, I don’t plan to subsidize them. When you subsidize, they don’t care to perform? In Tunapuna, as in every constituency, we need to take back our country. The UNC has a plan to transform Trinidad and Tobago, but we need all hands-on deck. Tonight, I call on everyone, let us unite, let us work together to get T&T working again. 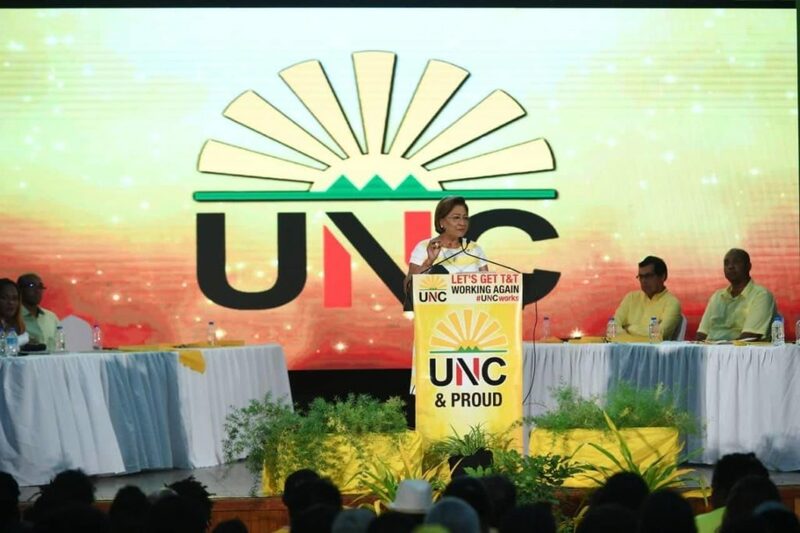 Your support on the ground, in our party groups, at the planning table, is what will make the UNC an unstoppable force in the upcoming elections. The UNC is a party for all of Trinidad and Tobago. The principles that guide us – the safety and security of our families and the nation, opportunities for all, empowerment through education and skills development, integrity and good governance – these principles inspire our people to work together to help build a better future for our country. The UNC worked hard to improve the lives of all citizens, and we remain committed to doing this when we return to Government. Are you ready to move with us? Are you ready to return the party with a plan to rescue Trinidad and Tobago from this uncaring, incompetent Rowley-led Government? Let us work together to return our beloved nation to greatness. God bless and thank you all.